Boil the kettle and whilst you are waiting make a start on the salad. You can either spiralize or grate the carrot and courgette into a large bowl. 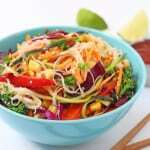 Chop the red pepper and red cabbage into thin strips and add to the bowl, along with the sweetcorn and sesame seeds. Chop the tenderstem broccoli into small stalks and place in a saucepan with boiling water. Cook on high for 3 minutes or until the broccoli has just started to soften. Remove from the heat and add the rice noodles. Cover the saucepan with a lid and leave for 5 minutes. In the meantime make the salad dressing by mixing all the ingredients in a jar or cup. You may need to add more or less water than stated depending on how you like the consistency. Once the rice noodles are soft, drain the water away and add the broccoli and noodles to the salad. Pour in the salad dressing and mix well until everything is well combined.